Since I started my Christmas decor with the bedroom mantel earlier this week, I thought I would go ahead and show you the rest of the master bedroom. I was really excited to get out the reds and blues this Christmas. As much as I loved the pink from last year, I missed the warmth of the red. Several years ago I bought this blue plaid flannel duvet cover for the down comforter and it is definitely warm and toasty at night! 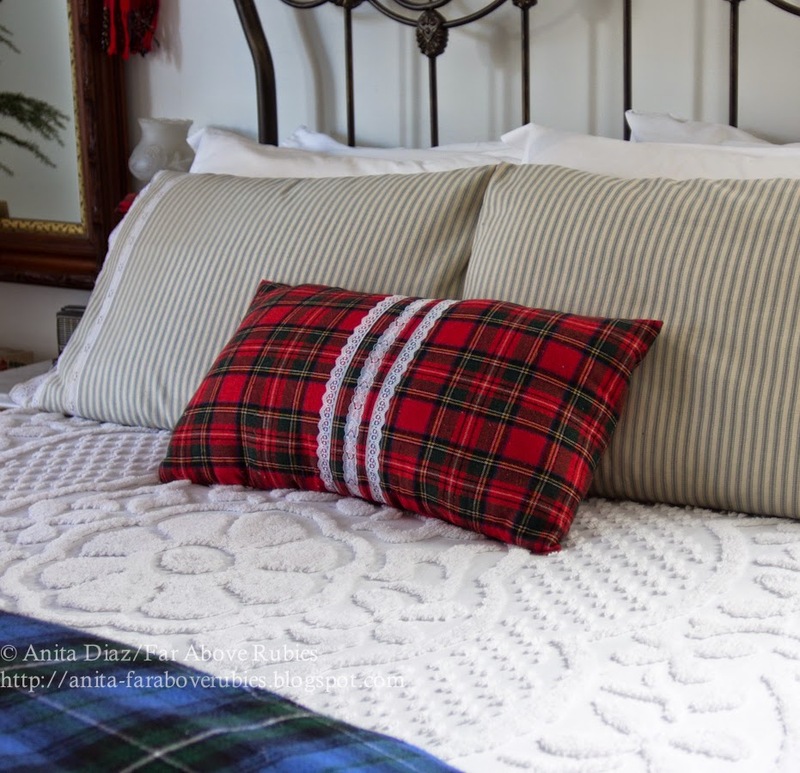 I kept the white pillow shams and blue ticking I made and added a red plaid pillow made from an old kilt. A neighbor gave me the metal frames, so I placed vintage Christmas cards in them, including one my grandparents sent for my first birthday. 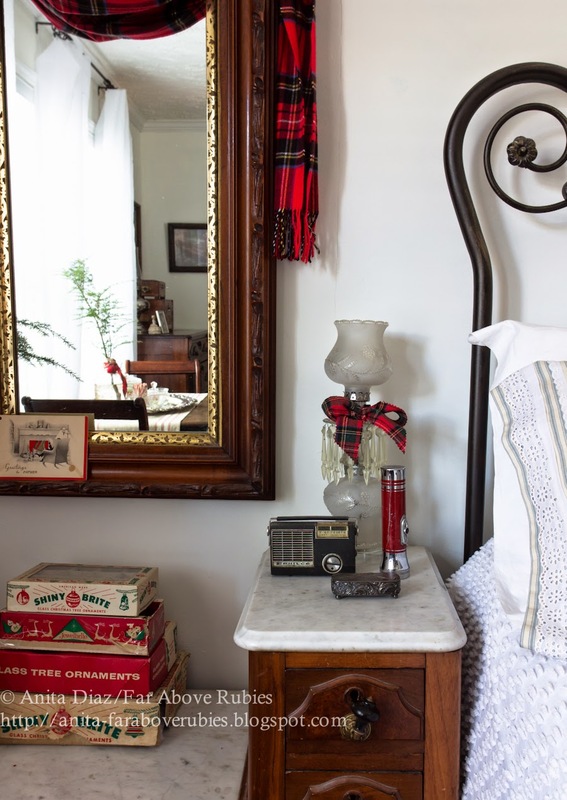 I draped a Scottish cashmere scarf across the mirror, and left a few vintage ornament boxes on the dresser. 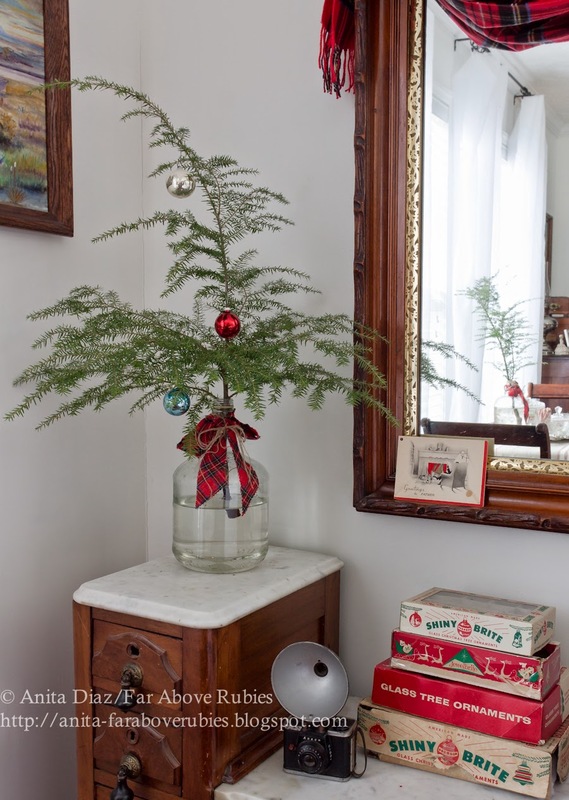 I love a good Charlie Brown tree, and this little hemlock branch certainly fits the bill in a vintage vinegar bottle dressed with tartan ribbon. Our bedroom is next to the creek and woods, and I have my great grandfather's drop leaf table there ready for a cup of coffee or snack. We are definitely enjoying the festive, warm feeling this room has this season, and we have already had some very cold weather here. You can see the mantel HERE. I love it all, Anita, especially the tartan plaids. 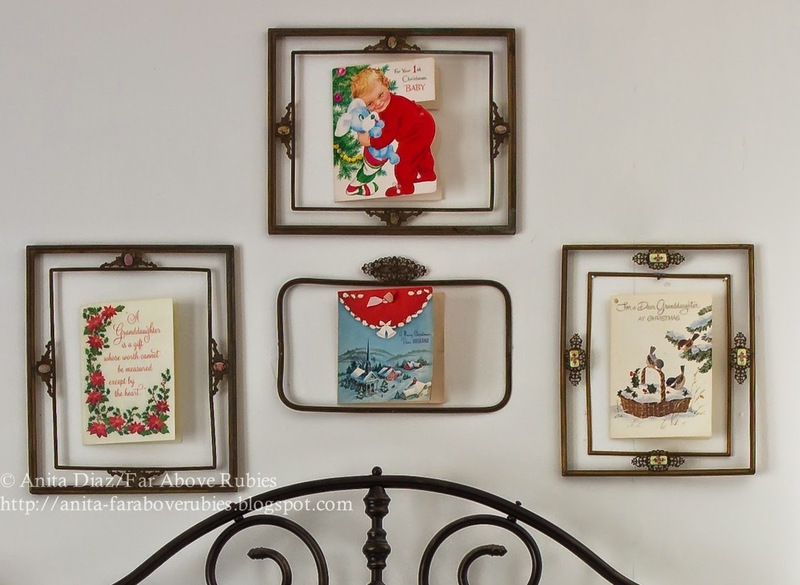 The vintage Christmas cards are so sweet in the metal frames! It was very cold here in Winston-Salem, yesterday. My mom and I were out shopping, and the wind was bitter. I'm sure you're glad to have the warm and cozy comforter on your bed right now. Love this room, Anita. So cozy and colorful and filled with charm. 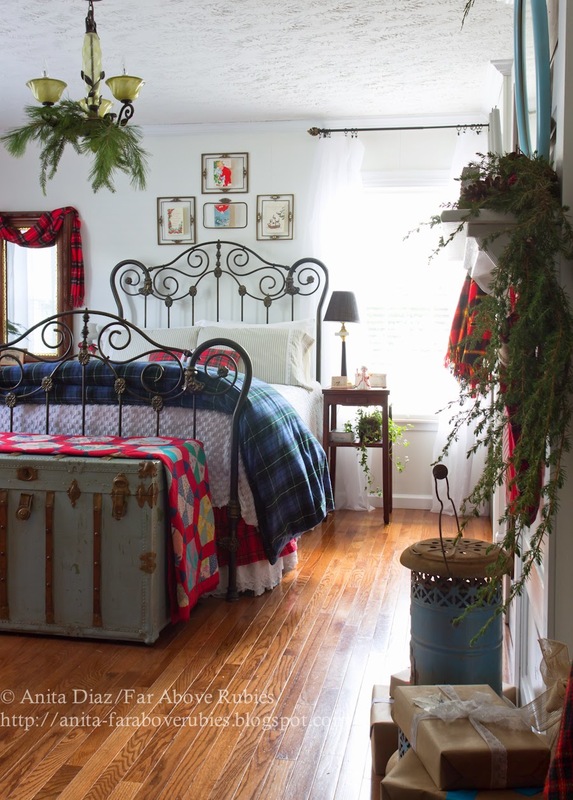 Love the plaid bedding. LOVE LOVE LOVE...the bedding...the fireplace...that pretty tray near the window...love it all!! There's something about tartan plaid that puts me right in the mood for Christmas. 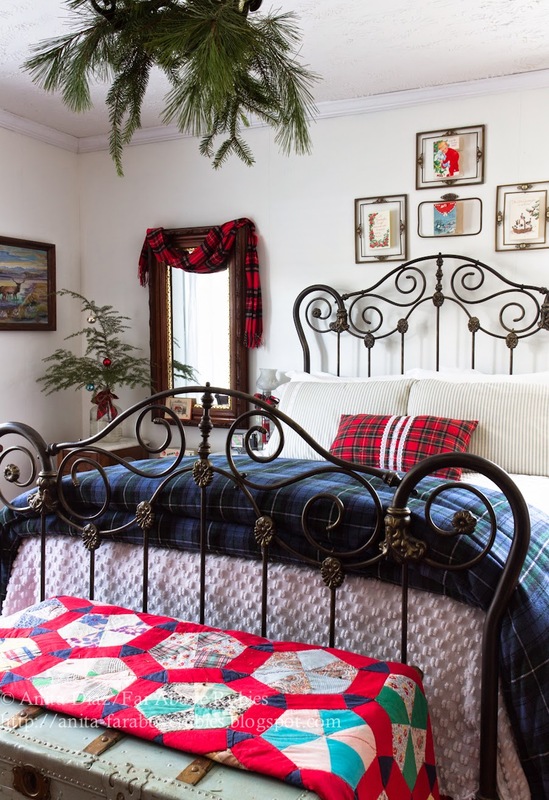 Your room looks so cozy and festive, and I LOVE the iron bed! 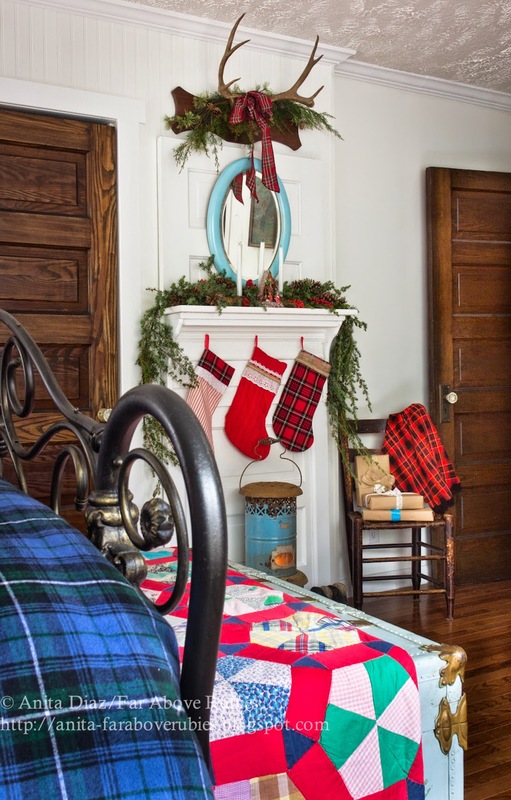 Anita...the bedroom mantel certainly set the tone for us for the bedroom reveal...as with the mantel, it is so festive and full of warmth and wonderful character....you have an amazing view and crushing on the quilt at the foot of the bed! Beautiful, inviting room. Absolutely love it! Anita..your bedroom is so pretty and warm, you have dressed it up just perfectly for the holidays. The red and blues and plaids, I love it all. The view out your window is simply gorgeous! You bring the Christmas spirit everywhere and I love that. Thank you for your kind comment. I need to visit more often. Whoa.....you are some soprano! I am covered in goosebumps. Such a cozy room. I feel like I can just snuggle up for among winter's nap! 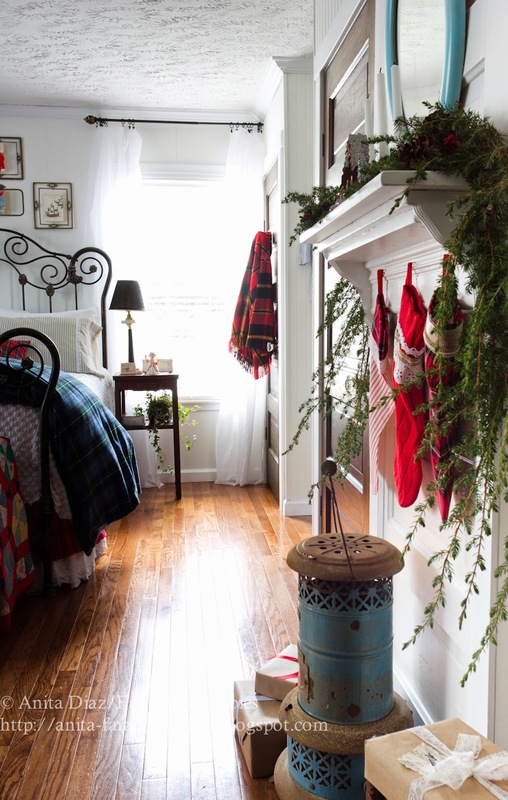 What a beautiful and cozy holiday bedroom. 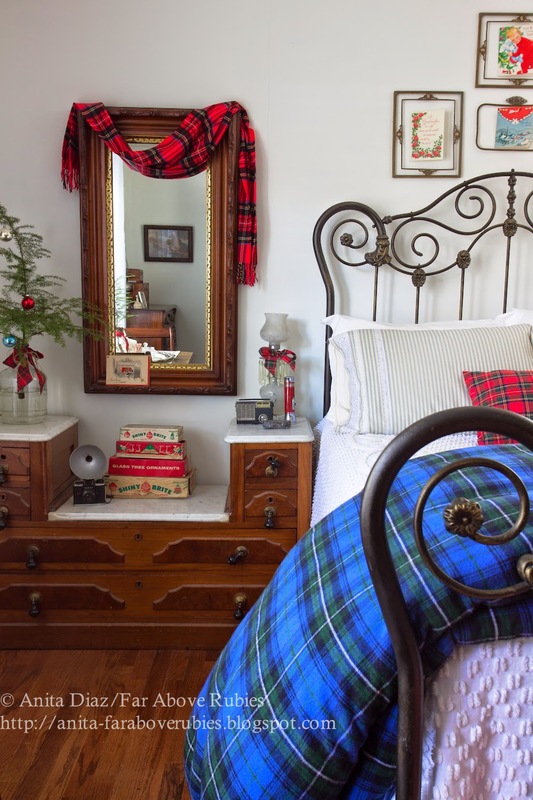 I love everything - the plaids, mantel, accessories. Your door mantel is beyond creative and the kerosene heater just cinches the vignette. I have a couple of those doors in my garage! I am beyond stunned by your creativity and attention to detail. Wow, wow, wow! You just went 1000% wild on the decor this Christmas season, Anita! And it all looks WONDERFUL!!! 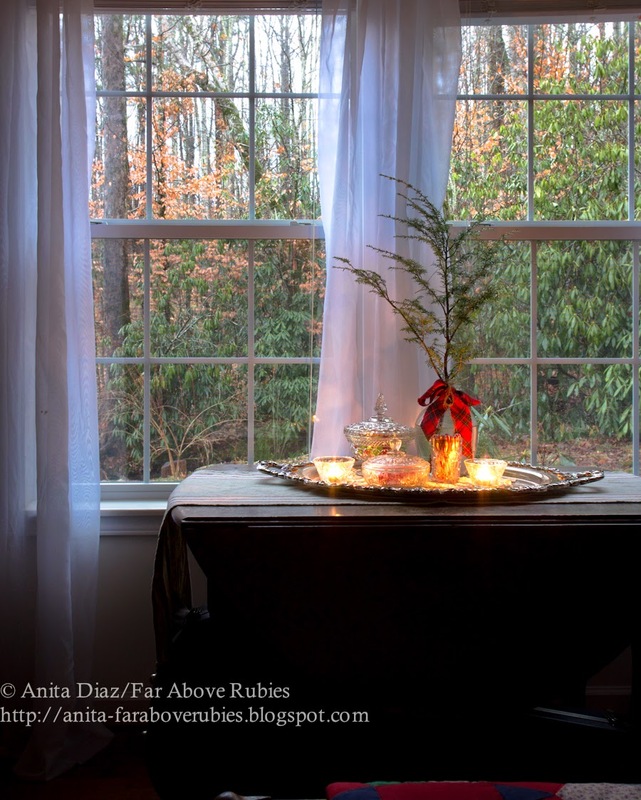 I love the little hemlock branch that looks like it is a runaway from the Christmas tree in the living room! So pretty and sweet and demure. 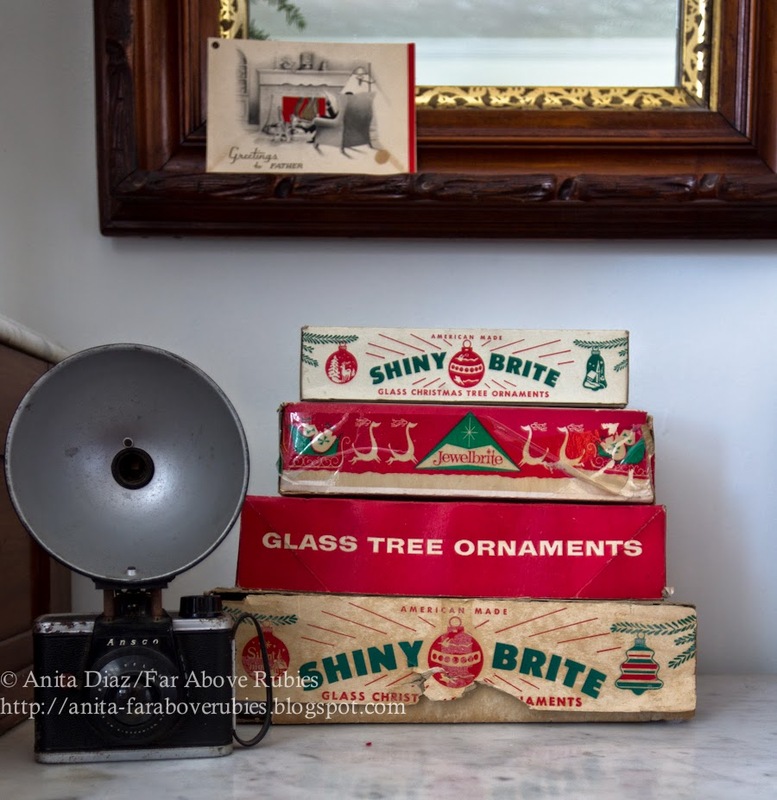 I also really love that you used the vintage ornament boxes as a part of your decor. VERY clever move! 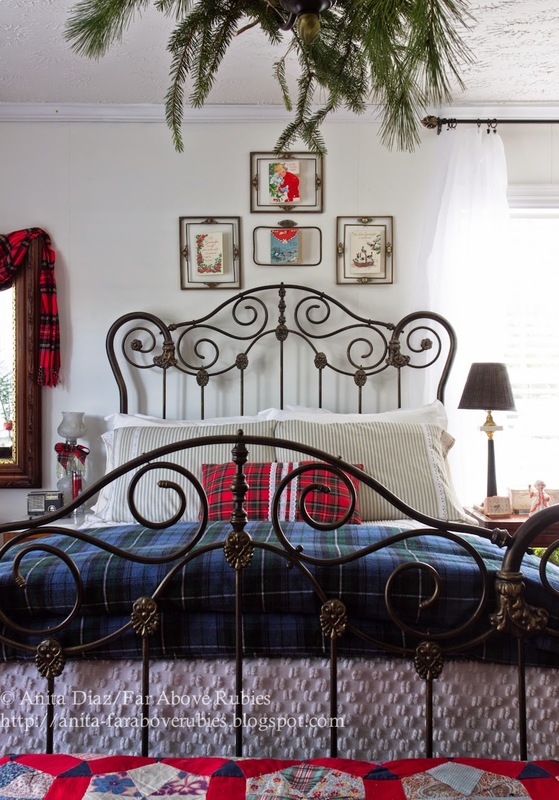 The vintage Christmas cards framed and hung over the bed are a stroke of sheer genius, too. They really work to pull in the spirit of the season on all levels in the bedroom. Your mantel area, of course, it just too cool!! !